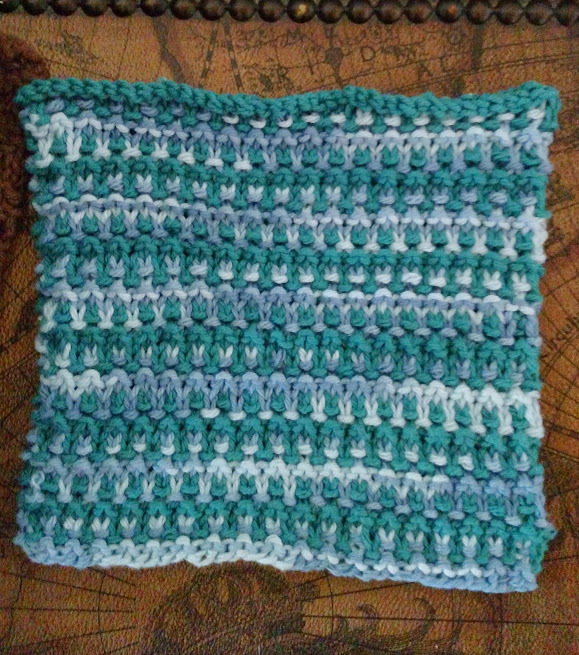 So yes, I know that technically the month of daily dishcloths was supposed to be over as of yesterday. But I woke up at about 5:30 this morning, worrying about Rosie and the weird hole in her mouth, and so I went upstairs to check on her (she demanded food, so all was as usual), and then sat down on the couch and stared at the remnants of my cotton stash. I started working on another boring garter stitch square (this time with stripes), but then realized I just couldn’t do it. Not more garter stitch. So I ripped it all out and started over and noodled around until I came up with something a little different. Each pattern repeat reminds me a little of zipper teeth, so I have dubbed it Zip It! Once that was done, I scribbled some notes and stared at the cluster of tiny little balls of yarn still remaining and I thought hmm, I bet this would work great with scraps. And so then I knit up Zip It! number two. I’ve been working today on firming up the pattern for the thing I spent most of yesterday on (including an awesome photo shoot with some very accommodating friends), but that isn’t quite ready to share. So instead I wrote up the Zip It! 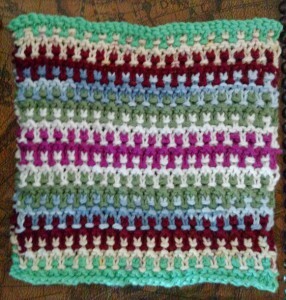 pattern, and uploaded it to Ravelry, and have made it available for free. 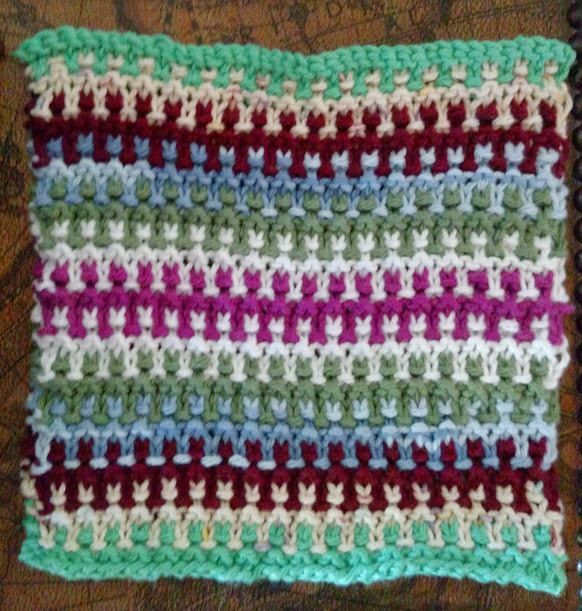 You can download it via Ravelry here. 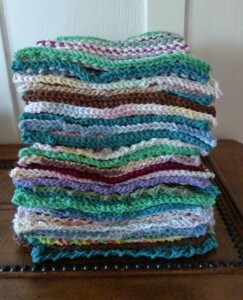 And with that, I believe I am finally done with the dishcloths. 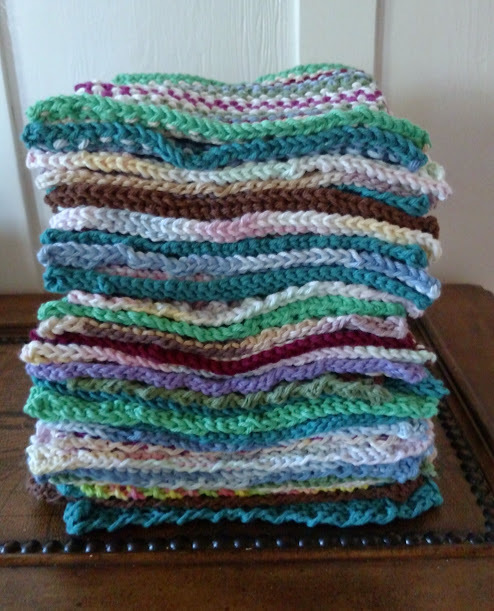 Grand total for this little personal challenge: 32 dishcloths. Boy oh boy, if I ever need to do some serious cleaning, I think I’m now ready. I love garter stitch, but have lately been learning how to use multiple colors, carry yarn and make patterns with slip stitch. 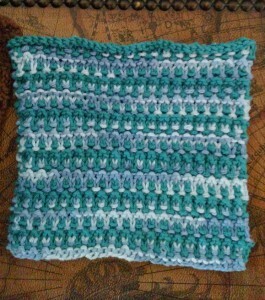 I love using cotton washcloths, but I don’t like making them, the cotton bothers my hands. Gearing up for the up coming A-Z challenge and having some fun visiting and meeting more bloggers, look forward to getting acquainted.